Social Crisis Mapping is more popular than ever: Lybia Crisis Map as example. Latest crisis, like the earthquake in New Zealand and Japan followed by the nuclear endangerment keep us breathless. But these crisis have born a new very popular field of web mapping, which can be called as Social Crisis Mapping. The first big event where these kind of effort has be seen on a large scale was the Haiti earthquake in 2010. Social Crisis Mapping tries to collect as many information as possible from different social networks and put them together on a map, which fuctions as usebale interface. People can quickly get an overview about the situation and find locations where news are related to or facilities has etablished or dangers occur. 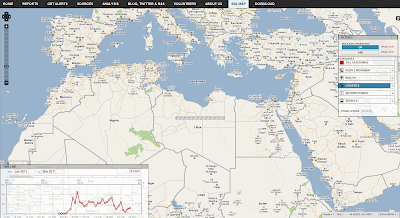 The latest Social Crisis Map I have found on the web covers the Lybia crisis. A detailed map includes a timeline and points different layers on the map. The CrisisMappers Standby Task Force has been undertaking a mapping of social media, news reports and official situation reports from within Libya and along the borders at the request of OCHA. The Task Force is also aiding in the collection and mapping of 3W information for the response. UNOSAT is kindly hosting the Common Operational Datasets to be used during the emergency. Interaction with these groups is being coordinated by OCHA’s Information Services Section. The public version of this map does not include personal identifiers and does not include descriptions for the reports mapped. This restriction is for security reasons. All information included on this map is derived from information that is already publicly available online (see Sources tab).